Last week, my friend R and I went on a tour of the Gowanus Canal, a scrappy body of water that runs through two miles of industrial Brooklyn. The tour was organized by a group called the Urban Divers, a mysterious bunch who had leafletted R at the West Indian day parade. All we knew was that the tour was five hours long and cost nothing, and in a town of $90 two-minute helicopter rides, five free hours on the water sounded like a steal. Given sufficient beer and sunshine, we reasoned, even the dullest ecological tour could be made bearable. So on a beautiful, cloudless September day, we packed a lunch and headed down to the shores of the Gowanus. Built in the 1860's to give Brooklyn more access to barge traffic, the Gowanus was once the busiest shipping canal in the United States. It brought in most of the brownstone used in the 19th century building boom, and it remained a major commercial canal right through the Second World War. But with the advent of container shipping and the Interstate highway system in the sixties, the canal lost all its economic value, and today is only used by a bare handful of cement plants and scrap metal yards. I had been a Gowanus fan almost since my arrival in New York; my commute to New Jersey took me over the canal twice a day, and the early morning sun tended to show it to its best advantage. As people who've seen my paintings know, I'm a sucker for skeleton factories and derelict infrastructure, and on both counts the Gowanus delivered. It was one of the first places I had started painting after quitting Mellon, setting up on the Hamilton Street drawbridge looking north where the F train crosses overhead. I knew nothing about the canal itself, but I assumed it served some intricate industrial purpose and was eager to learn more about it. R and I showed up early, just as a group of volunteers was finishing its trash detail along the canal banks. I looked with longing at a small group of canoes pulled up on shore, and to my astonishment, the group director offered us the use of one while we waited for the rest of the tour group to arrive. Two minutes and one waiver later, having assured everyone that we knew what a J-stroke was, we were out on the water. The day was off to a fine start. 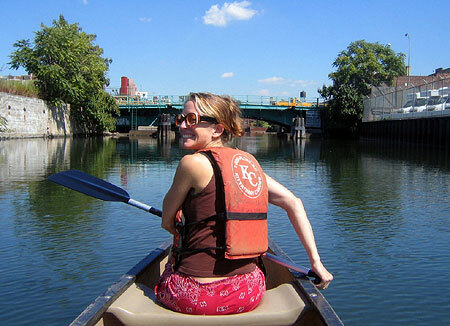 Like so much in life, the key to enjoying the Gowanus is lowering your expectations. The canal has been through a lot, and it has been hurt before. It knows that it is no supermodel waterway, it knows that it needs a good dredging and possibly a Superfund grant just to get itself halfway into decent shape. It does not pretend to be some golden-haired World Heritage estuary filled with cranes and egrets. Then again, neither is it the Cuyahoga. Given half a chance, aesthetically speaking, it's the hardest-working body of water in New York City, and you'll never tour a more grateful urban canal. 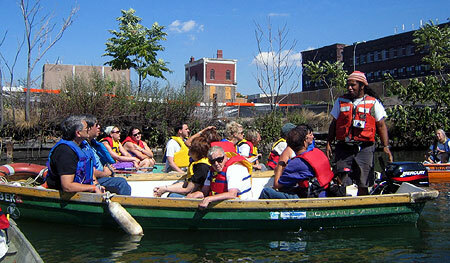 Up until a few years ago, the Gowanus did seem beyond hope. The aptly-named flushing station that brought fresh water in from the East River (a phrase to set off warning bells) had shut down in the 1960's, after a worker dropped a manhole cover into its motor. The canal had then stood stagnant for over thirty years. There are dramatic photographs of one of the first diving expeditions into the canal, which start with a diver wearing an all-white bunny suit and end with him emerging completely black, as from a pool of ink. He described it with great tact as a 'Zen experience'. The flushing station was repaired in 1999, and has made a dramatic difference, though it remains fickle and prone to breakdowns. And no amount of pumping can change the fact that the canal fills with sewage when it rains - anything over a fifth of an inch and the sewers spill over, making the job of the flushing station all too literal. Fortunately for for our excursion, the pumping station had been working, it had not rained for over two weeks, and the canal looked positively natural. The water was green from algae, with tiny fish darting around under the surface, and reflected the bright buildings around it like a flat mirror. The feeling of being at peace in nature (perhaps on a calm Dutch canal somewhere) was so overpowering that even a cormorant had forgotten himself so far as to land in the canal and strain for minnows. The tour attracted some fifty people of all ages, who set out in an earnest flotilla of rowboats, canoes, and assorted flat rafts. The Urban Divers own a large boat that would fit everyone, but while the Gowanus is nominally still a navigable canal, it would take superhuman determination to try and get past the southernmost two bridges. 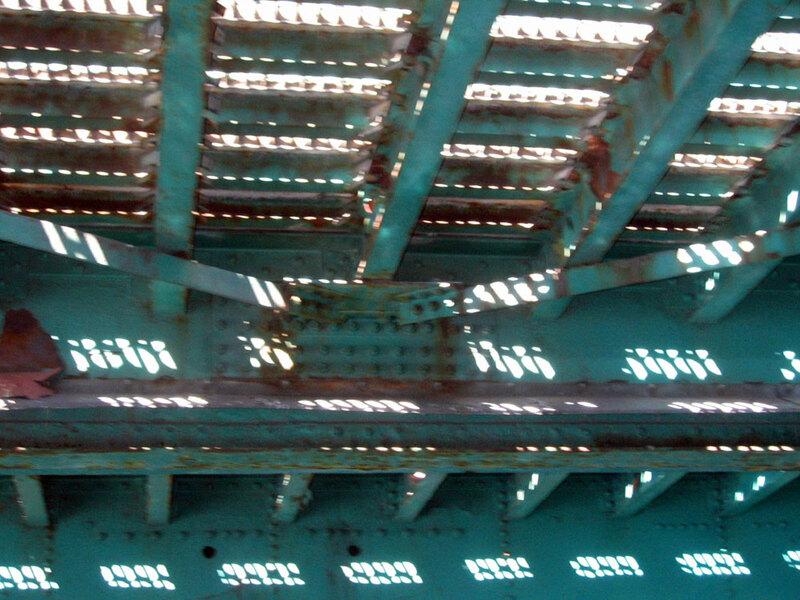 Each bridge opening requires six hours' notice, and as there is only one drawbridge operator, barges or boats have to wait for him to open one bridge, close it, get in his truck, drive to the next one, stop traffic, open the bridge, and repeat the exercise for however far up the canal the boats want to go. Given that the canal hasn't been dredged since 1955, nothing with more than a twelve foot draft can even make it very far up the waterway. Our tour leader was an affable dreadlocked man who had been fighting the good fight for the Gowanus for several years now. 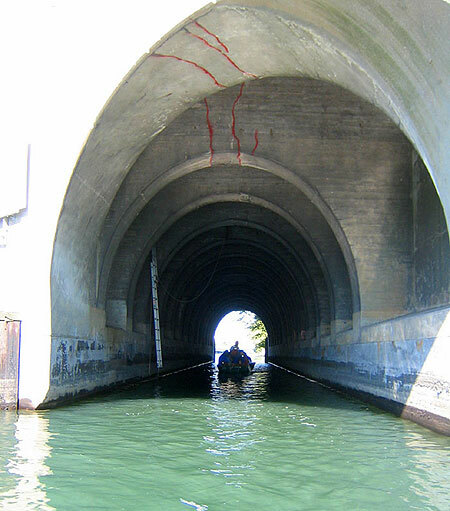 He puttered around in a small motorboat with a few lucky passengers, pointing out outflow pipes, illegally filled areas, crumbling bulkheads and other peccant parts of the canal infrastructure. The rest of us paddled behind and struggled to keep up. 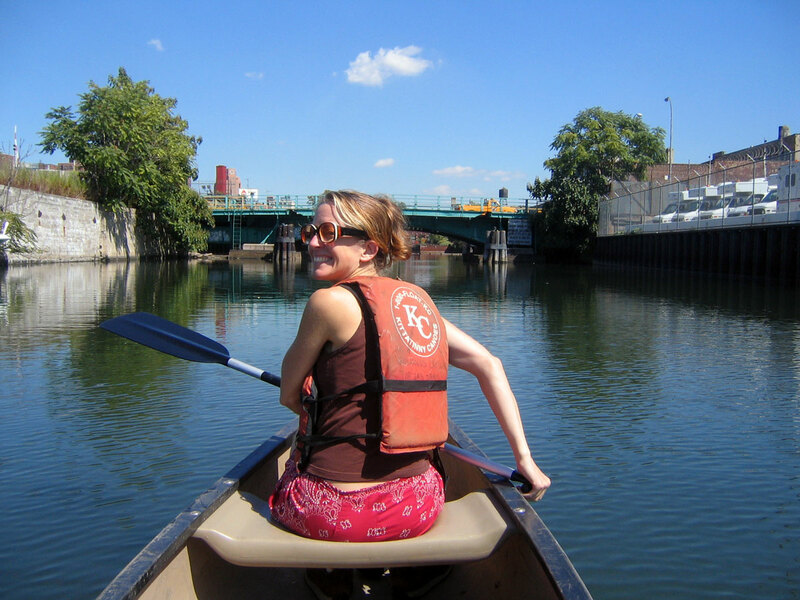 Paddling down the Gowanus was slow going - I was one of four people in a boat shaped like a long soap dish, and about as seaworthy. The canal alternated between stretches of limpid green water and the occasional small oil slick or suspicious-looking floater. After a short tour to the northern end of the canal, our leader led us toward the bay, to check on fish traps that had been set out under the bridges. The first was empty and had been left open ( "Vandals!" he cried, though I'd be hard-pressed to think of a meeker act of vandalism). The second trap was intact, and came up with a handful of minnows ("minnows can live in piss!") and a jaunty looking little crab, who proved hard to identify. I didn't catch the final verdict, but he was either a blue crab (a boon to mankind and completely edible, provided you eat the claw meat and avoid the much-sought-after 'yellow butter'in the belly, where all the poisons go) or the dreaded green crab, an inscrutable, invasive species from the Orient. Whoever he was, he looked small and angry, the way you would expect to feel after spending the better part of a week in the Gowanus, stuck inside an unbaited trap. All told, we were informed with pride, the canal was home to fourteen distinct species (my guess at a breakdown is three strains of amoebic dysentery, four of e. coli, algae, minnows, flounder, the two crabs, and the cormorant). The flounder were a bit of a surprise to me - it appears that they come in to do their breeding in the canal, since it's a sheltered inlet off of the main mouth of the East River. At first blush, the Gowanus may not seem like the most romantic setting, even for fish, but in the right light it can start to look downright dreamy. 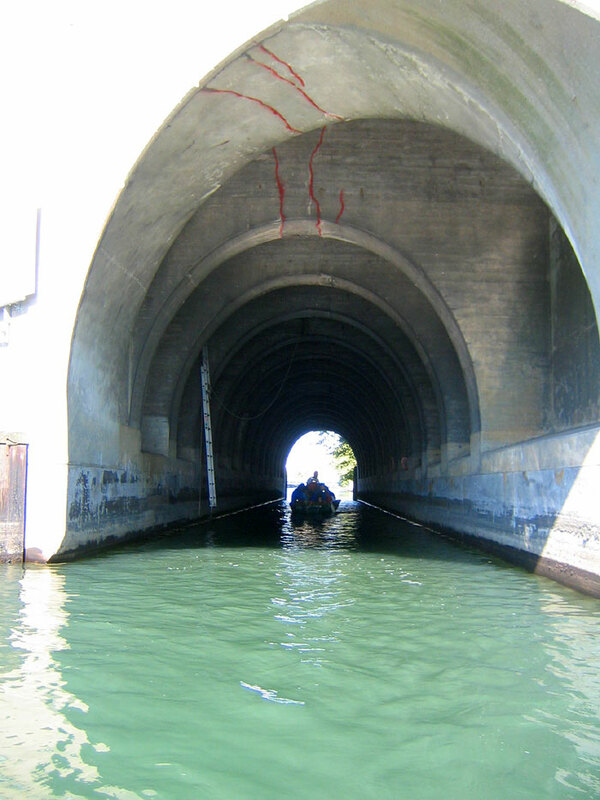 At several places on the canal, we had to pass under quite low bridges of perforated metal, and the shadows these cast onto the water formed long, three-dimensional fingers of light beneath the surface, looking like a forest under the green water. With the indestructible minnows swimming among them, the setting looked downright welcoming, and I admired the tenacity with which living things insist on making a home for themselves in the most unwelcoming places (like Canada). Had I been a flounder, those bridges would have put me right in the mood. The canal is a strangely quiet place if you are used to a hectic New York. You pass rusty barges, abandoned wharves, empty silos, and street after dead end street, but apart from the bridges there is never a moving vehicle or pedestrian in sight. Still, there are suggestions of life - a row of potted tomato plants lined up on a ledge, beached houseboats, an abandoned rocking horse, the occasional empty bottle of malt liquor. If the Urban Divers have their way, this ghost town will someday turn into a green space filled with happy locals. It is distressing to think that the Gowanus is only a few avenue blocks away from the Scandinavian stroller crowd in Park Slope and Carroll Gardens; a little more cleanup and one can see them descending in carefully sun-blocked droves for a day's outing along the water. One of the main goals of the Urban Divers is replacing concrete embankments along the canal with setbacks, creating strips of green space that would also absorb runoff from the giant inclined slab of pavement to the east (called Park Slope for a reason). Made wide enough, these could serve as a canal-side park, though how to do this without instantly gentrifying the neighborhood out of the range of its current residents is unclear. To make the canal truly suitable for aquatic life, the Corps of Engineers must one day dredge out the layer of toxic sludge, chemical residue and mafia squealers coating the canal bottom - right now anything that tries to grow or burrow in the bottom sands finds itself quickly poisoned. 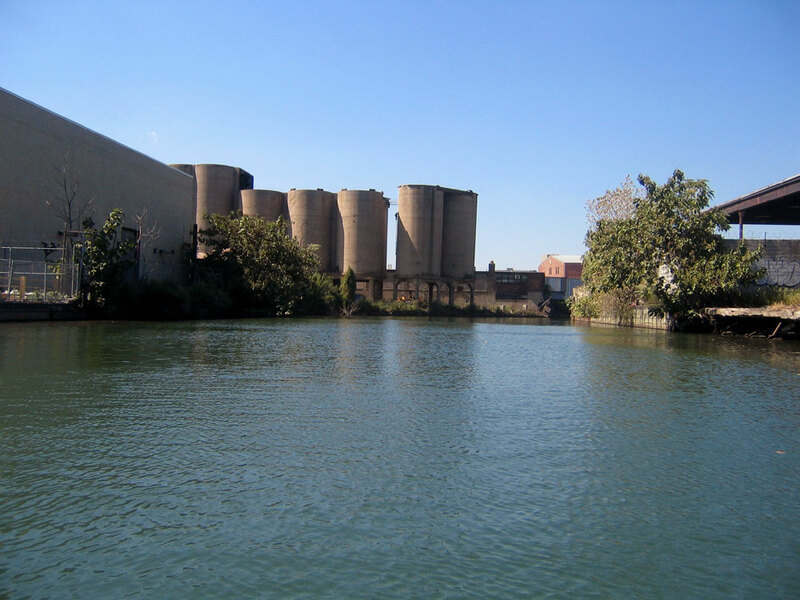 And something will clearly have to be done about those icky storm sewers - one idea is to rehabilitate the abandoned silos along the canal as holding tanks for effluent; other ideas involve elaborate processing plants in nearby Red Hook. For now, though, it's a question of baby steps and pragmatic projects to draw people's attention to the canal. 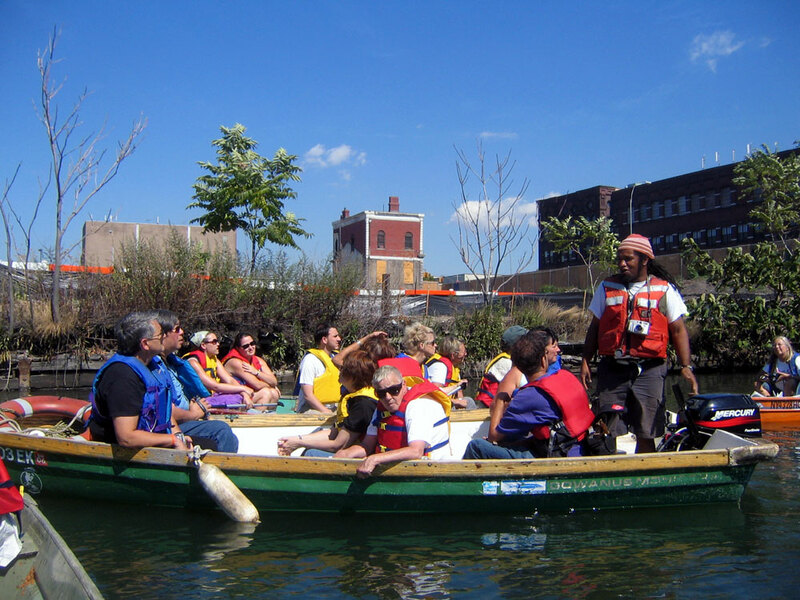 Though the plans for greening up the Gowanus can sound impossibly ambitious, the canal volunteers are being quite shrewd, exploiting a section of environmental law that says water quality standards must be brought up to the level of habitual use. If enough people regularly go boating on the canal, for example, the state will have to ensure that the water quality meets standards for recreational boating. This strategy would presumably work all the way up to the most rigorous water standard, edible shellfish, but I think it will be many years before even the most dedicated activist again tucks into a Gowanus oyster (a pity, since they were prized in colonial New York). The hardest part of the task may be psychological. The Gowanus and other urban canals are so notorious for their filth that it takes an effort of imagination to picture them restored to something approaching nature. And people are much less reluctant to dump waste into water that looks beyond hope, perpetuating the problem. But the Urban Divers make a persuasive argument - we are all paying through the nose to live in this city, through higher rents and higher taxes, so why should it be ridiculous for us to demand the minimal level of water quality mandated by law? And why is it so out of the question that the New York waterfront be as pleasant a place as the beaches and parks in outlying communities, the places people escape to in summer as soon as they get the chance? This argument resonated with me. I have been puzzled since moving here by the strange relationship New Yorkers have with their waterfront. You would hardly think this is an island city. For every enjoyable stretch of coastline like Pelham Bay, Coney Island, or the East Village, there are a dozen miles of waterfront that are fenced off and abandoned (Greenpoint), blocked by highways (much of Manhattan and Brooklyn) or gratuitously kept out of reach by landscaping that ignores the water altogether (Red Hook, Battery Park City). It would be one thing if the waterfront were packed with high-end developed properties - at least then the inaccessibility would make some kind of evil sense. But most of the Brooklyn riverfront consists of rusty, fenced-off industrial space, left over from an earlier era and never reclaimed. I get torn when it comes to proposals for urban renewal - on a selfish level, I like the emptiness of the gutted factories and the hulking structures around them; if the fences came down, I'd be in seventh heaven. On a pragmatic level, I worry about destroying Brooklyn's connection to its industrial past just to replace it with big box stores and luxury condos, depending on the quality of the view, a process I saw more than enough of in Vermont. But who can deny people their right to clean water, and a land use policy that at least acknowledges reality? There has to be a way to embrace these industrial relics without destroying them, and with their touching devotion to this old canal, the Urban Divers seem to have found one way to do it. 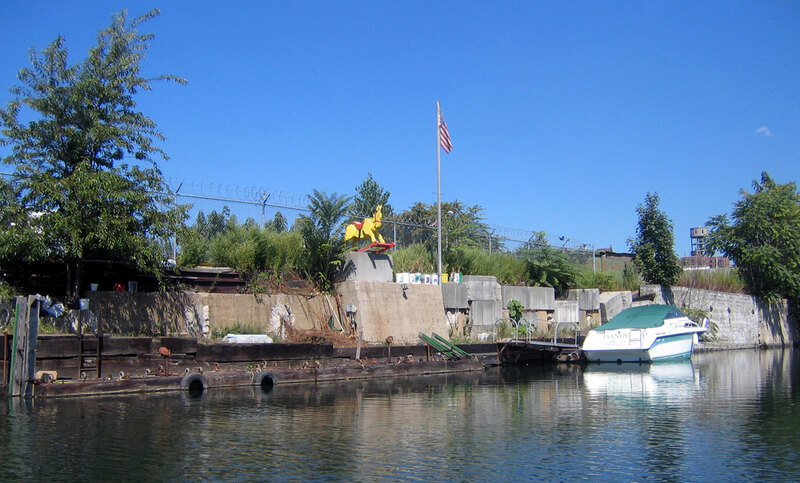 You can find out all about Gowanus tours and volunteering opportunities on the Urban Divers website - don't be put off by the scary neon navigation, there's a lot of interesting content hiding in there. 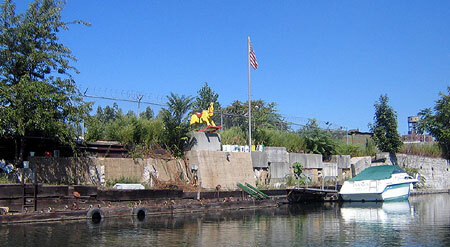 The wikipedia article on the Gowanus Canal is also quite extensive.